In mid November I ran a post on Convera Corporation (NASDAQ:CNVR) (see the CNVR post archive here), which was in the process of liquidating and planning to pay distributions valued in the range of $0.26 to $0.45 per share. The stock was then trading at $0.221. The distributions consisted of three cash payments with a value of $0.26 per share ($10M on liquidation, and a $2M payment on each of the 6 and 12 month anniversaries of liquidation) and a share in a newly created company, VSW, worth between nothing and $0.14 on pretty heroic assumptions. The most recent 10Q is a little troubling because it doesn’t mention the two $2M distributions, which account for about $0.07 of value in the liquidation. They are still included in the original plan of liquidation and therefore by reference in latest 10Q. We have not, however, been able to contact the CFO to confirm that the distributions are still payable. I believe that some distribution is still payable, but not in the quantum originally estimated by the company. 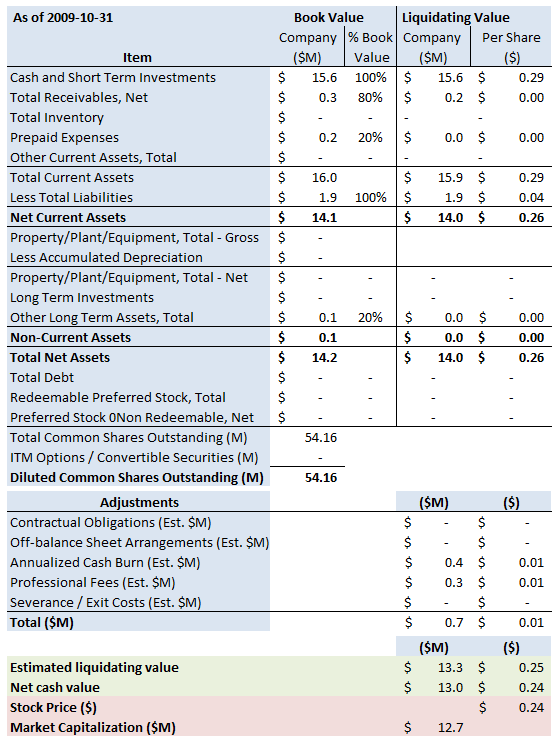 My rough estimate, based on the accounts as at October 31, places the total cash distributions slightly lower than the company’s last estimate at ~$13.0M or $0.24 per share. We plan to distribute $10,000,000 shortly after the closing of the Merger, with the remaining $4,000,000 to be distributed in $2,000,000 increments at six months and 12 months after the closing of the Merger, subject to possible holdbacks for potential liabilities and on-going expenses deemed necessary by our board of directors in its sole discretion. The present value of this cash distribution, assuming a discount rate of 10%, is estimated at $0.26 per share. Based upon the above analyses, the value indications for the cash and VSW stock to be received by our stockholders in exchange for their current Convera shares are within a range of $0.37 to $0.45 per Convera share. On June 1, 2009, we announced our plans to merge our search business with Vertical Search Works, Inc. and our expectation to adopt a plan of dissolution with orderly wind down and liquidation of Convera before the closing of the merger. The merger with VSW contemplates the transfer of all the business assets and obligations of the search business, including $3.0 million in cash and a $1.0 million line of credit to VSW, subject to certain adjustments. The plan of dissolution contemplates a $10.0 million dividend to shareholders of record at the close of the transaction and an orderly wind up of Convera’s remaining obligations over the twelve months after closing. We believe that we have sufficient cash resources on hand to complete the merger and the plan of dissolution. We expect the conditions for the closing of the VSW transaction will be met early in 2010. However, we make no assurances that either the merger or the plan of dissolution will be completed. According to my back-of-the-envelope calculations, the distributions estimated by management seem slightly high, but my estimate is sensitive to the quantum of the cash burn and professional fees. At the present stock price, there’s no upside in the cash distributions. The share in VSW may present some value, but no sensible estimate can be made as to that value. The range is likely nil to $0.14 per share, and I believe nil is the more likely end of the range. I’m going to maintain Greenbackd’s position in CNVR because I think the worst case scenario – which is probably the most likely scenario – is that the position is a wash, but there is some small chance that there is value in VSW. Convera Corporation (NASDAQ:CNVR) is a liquidation play. The stock closed yesterday at $0.221. The company estimates the value of the distributions to be in the range of $0.37 to $0.45 per share. The trading price of the VSW stock is an unknown, but the $0.26 in cash distributions offer some protection at yesterday’s close of $0.221. Buying up to say $0.23 means getting paid $0.03 to hold a free option on the VSW stock, which, according to Hempstead, the financial consultant providing the fairness opinion, could be worth between $0.11 and $0.19 per share. It’s very thinly traded at this price, so good luck getting set, but it’s worth buying if you can get a reasonable line of stock. I’m going to add it to the Greenbackd Portfolio at yesterday’s close. CNVR closed yesterday at $0.221. The S&P500 closed yesterday at 1,093.01.